I’ve been involved in Multi-Level Marketing companies and like I’ve said many times and that is MLM is not for me. There are several reasons why I prefer to steer away from these types of business models. I won’t go over that right now because it is about Monat Global. Now, before I go over my findings about Monat Global, I don’t want people to think just because MLM is not for me that I’m going to call it a scam. In my review I’m going to let you know if Monat Global is a scam, the complaints people have and more importantly, do you really own your own business. I’ve reviewed many different types of MLM systems that either don’t have a product and ones that do. From my experience and what others told me, MLM businesses are very difficult to build. Usually what happens is that when a business associate is trying to build their downline, people join then quit and when you replace them, they may be juiced up in the beginning then they fizzle out. This is why MLM comp plans are designed to put those incentive bonuses within their start-up plan because they know people are gonna fizzle out quite rapidly. Also, Network Marketing businesses tend to have rules that you must abide by. Now I’m not saying that all their rules are bad. Actually, some of their rules are quite ethical, however, some of their rules can limit your income potential. So with that being said, let’s get right to this! The gist of what is Monat Global it’s a network marketing company and their product is in the hair care field. They offer a number of haircare product that their Marketing Partners can sell to the general public along with a Multi-Level compensation plan if people decide to take part with their system. Before you are able to become a distributor for Monat Global, you would have to purchase one of their starter kits. Each starter kit offers a free website to help you market their opportunity. The $99 starter kit doesn’t come with products, however the other starter packs does and the incentive is that you get the products at a discounted rate. Also, when a Marketing Partner recruit someone and they purchase one of the starter packs, they earn a commission. What Are The Products That Monat Global Offer? When I looked into Monat Global’s product line, they have a lot of different products that their distributors can sell. All of their products are naturally-based, but they explain why it is not all natural. I don’t think they have as many products as Avon, however, it’s quite a few. Like I said above, Monat Global is in the hair care field so being that people have different types of hair, they have a list of products that are available. 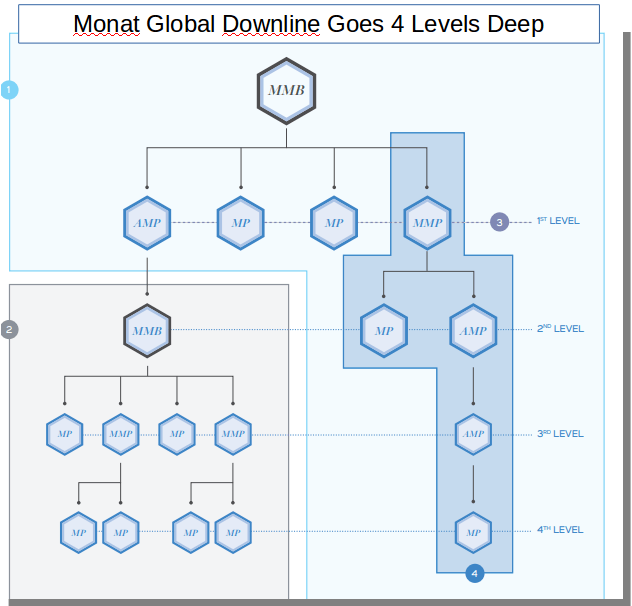 How Does Monat Global Money Making Opportunity Work? Normally I would go in depths in regards to an MLM comp plan, however, I feel that Monat Comp Plan is similar to many MLM businesses. MLM businesses are based on downlines and being a part of a good team. The more people you and your team recruit is based upon the amount of money you can make. As you know, Monat has actual products that their partners are able to sell so that also applies to their comp plan. Everyone starts off as a Marketing Partner. Also, building your downline allows you to increase your standings with Monat. Once you start building your downline and increase your PV, you move up to Managing Marketing Partner. Every time you’re able to do that along with your team duplicating what you accomplish, your income increases. I’m not showing scenarios or examples because every time I explain a comp plan, people feel they are confusing which I agree. So this time, I thought I’d just explain in the most simplistic way how people are able to make money through Monat Global opportunity. Now that you got the gist of what Monat Global is all about, I want to cover very important details that I feel people should know about. Is Monat Global A Scam? I’m sure you’re probably wondering if I’m going to call Monat Global a scam, I’m not because their Marketing Partners are able to sell products to the general public. I also personally feel that their products are on the expensive side, but I don’t feel their products are not outrageously priced. What I mean by that is that is there some high-end products that can be similarly priced to Monat that people purchase. We all have different PH balances and different hair types. What works for one person may not have the same effect for another. So, their partners are able to sell their products to the public who really enjoys what they purchase despite that the prices are on the high end. In the beauty field, if something is working for a woman, if you have the money, you’re gonna spend it on products that are beneficial. After watching this video, I personally felt, would I risk my money on a product that can cause hair loss and my answer is no. Being that people use other products that actually do the job, you’re talking about a women hair which us girls value. Would they risk trying something that might possibly do damage? ==> There is a way to promote products and services that you stand behind! Some MLM opportunities limit their partners, associates or distributors causing that whole downline opportunity to really be a difficult way to make money. We live in a time where people can communicate through the Internet which is a global opportunity. What I found out is that you can’t have your own independent website. You have to use what I call their stock or replicated website which is the exact same website everyone gets. These websites don’t rank high on the Internet where you are able to obtain sales that way. Don’t get me wrong, I get it that these websites are designed for Marketing Partners to obtain purchase orders, however, linking a personal website to the replicated website that Monat Global provides I feel would actually help their Marketing Partners obtain sales. Also, you can’t place products in places like eBay to increase your PV. I feel that replicated info will get boring. People buy from people. People have a unique spin and I feel that MLM businesses can miss out on some of the most talented creators by disallowing their partners to grow their marketing and advertising skills. I feel that practicing your marketing skills leads to perfection and anyone starting off is not going to produce their best work, but in time, they will sharpen themselves by actually creating and practicing their skills that leads to a perfect outcome. I’m not referring to samples, I’m referring to advertisements. If people see the same ad by different Partners, there is no unique take. Even though some MLM businesses have products to sell to the general public, as you can see above, they limit their partners to sell PV. If you read the tidbit above, Partners may NOT use classified ads to list or sell retail items, however, Marketing Partners may use Craigslist to advertise their opportunity. 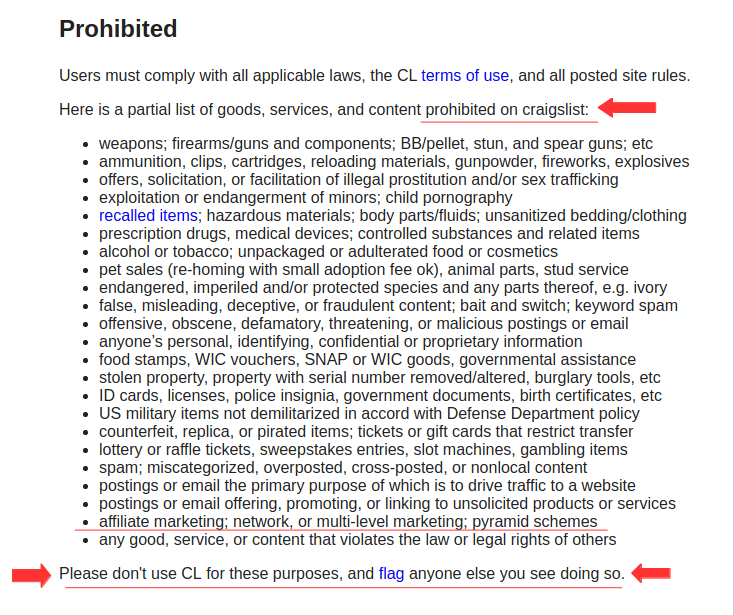 If you look at the image above, Craigslist prohibits listings such as MLM opportunities. So yet, Monat Global approves their Marketing Partners to recruit people using Craigslist but that violates Craigslist terms. In my book, a personalized website seems more appropriate and professional than having their Marketing Partners list an opportunity where terms are being violated. To be fair, Monat Global doesn’t want to get misrepresented by their Marketing Partners. Some times people do or say things that can dampen a company’s rep. Such as enticing people by over exaggerating the money they make when that isn’t really the case. Then when someone decides to duplicate their strategies, they are not experiencing the same outcome. By doing that, it can lead people to really question the opportunity. I feel Monat Global is correct about that which I feel is great. Do You Really Own Your Own Biz? Most businesses are based on sales. I feel like Monat Global limits their Marketing Partners by not marketing. Or are you only limited to PV based on friends and family members, parties and going to actual salons? Any comp plan that bases their sales volume on their Marketing Partners keep these types of businesses going. What I’m getting at here is that yeah they say you can sell their products to the general public but you make money when you recruit people and the people they recruit can purchase one of those starter kits. Another point I must add is that more or less what they are saying is if you’re unable to reach the sales volume required to make the commissions at whatever level, you can purchase the needed requirements to qualify. I feel that they make it difficult to sell to the general public, yet you as the Marketing Partner make sales based on the PV you spend and your downline spend causing it to be some sort of pyramid scheme. What Are The Income Disclosures For Monat? I found their income disclosure for Canada. You can scroll down to the bottom of the page and view it yourself. On average the Marketing Partner makes $22 to $1,188 every year. Being that people are building a “businesses” I get it that the income potential may vary. MLM businesses are difficult to build because besides being expensive, qualifications are needed to make those bonuses and that is based on PV throughout your team. In the Avon article I’ve written there are some questions I feel that people should ask if anyone might get approached about An MLM business opportunity. I’ve been involved in MLM businesses before and I feel that with any business you are going to build, income potential is there. I feel that people should build businesses that they are going to love and enjoy. It takes hard work and time to get where you want to be. Rough patches are gonna happen, but more importantly, start a business that you enjoy because when you experience a rough patch, the enjoyment of what you are building will sustain you. When I found what I was looking for, I was excited because limitations weren’t there. If you have any questions or comments about Monat Global, feel free to let me know below, thanks! ==> Want To Know What Is So Exciting About What I Found? Feel Free To Click Here! Shepherd In Wolves Clothing: Don’t Judge A Book By Its Cover! Thanks to you I found many things to know about this Monat Global. I think MLM marketing is not for everyone. I agree with you. Because its pressure can’t take everyone. This work is very good for those who have express and patience. Those unemployed, they come in emotion and the dream of earning money without knowing the work. That for later they lost their way. I think many people will get the idea from your article. The first MLM business I started, I feel it was through emotion and not really doing enough research. People may not realize the restrictions MLM businesses put on people along with do you really own it. Thanks for sharing your thoughts, Evelyn. Well, Evelyn, based on what you have written in your post I would say that this is, yet another MLM business to stay away from. Here are the two reasons I don’t get involved in MLM’s. First: I used to be a member of a business called Amway. I think it was an MLM because the only real way one could make money was through downline recruting. I think they had great products but one can only sell so much to friends and family. The scenario was the same, several levels of downline but one the real go-getters mad the money, usually at the top. The second reason is that one has to buy products and resell them at a higher price. This is hard to do because there is always going to be someone else that will sell lower than you and you will most likely end up having a bunch of product you can’t sell. In my heart, I know that Affiliate Marketing will be the answer for most people. Get the right training, have your own website, but NO PRODUCTS TO RESELL just content reviews about products with Affiliate links attached. There is work involved but if one is consistent and does not give up, in a year or so they may be able to say goodbye to their Job. MLM is not for me. I’ll take my chances with WA and Affiliate Marketing. Hey Wayne, you laid it out! I too was involved in MLM businesses and a lot of them focus on recruiting. When I learned about affiliate marketing, I knew it was what fit me. The work I’ve put into my own website and the work I put into an MLM business I’ve made a hell of a lot more money in a faster pace with my own website than what any MLM business had to offer. Thanks for sharing your thoughts, All the best, Evelyn. My wife is looking at joining the Monat Global business. I think your is going to be really helpful when it comes to her making a final decision. I for one am not for the MLM business. I have lost many valuable relationships when trying to build my network marketing business a few years ago. I realize that relationships are more important than money. It’s very evident from your review that Monat Global place a number of restrictions when it comes to marketing the business. At the end of the day, to me, it seems like it’s not really your very own business that you are building. Yeah, you don’t want to lose great relationships over business. I wrote in one of my other posts that I feel like when you approach a loved one about an MLM business, it’s like borrowing money from them and the way they will get their money back is by explaining the comp plan to them, Lol. All the best to your future, Evelyn. Thanks so much for taking the time to write this detailed review about Monat Global. I’ve been hearing a lot of claims about people making loads of money through it but I figured it was just another scam as you’ve mentioned. I like your point about it not being the person’s own business. Thanks for sharing and keep up the good work! Hey Marlinda, I’ve been involved in a few MLM businesses myself and find that you really don’t own much. If you look at owning your own business online, it is a business you can sell. Thanks for your thoughts, Evelyn.